Hyderabad July 13 (IANS) Bharatiya Janata Party (BJP) President Amit Shah on Friday said that construction of a grand Ram temple at Ayodhya will begin before the 2019 elections. Shah told a meeting of party leaders here that steps will be taken to clear the decks for launching construction of the temple before the polls. 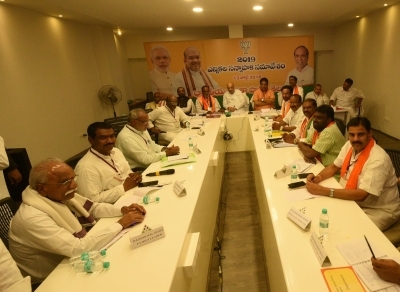 BJP National Executive member Perala Sekharjee briefed the media about the meeting at BJP s Telangana state unit office. "Considering the developments I believe that construction of Ram temple will begin before the coming general elections " Sekharjee quoted Shah as saying. The BJP chief who arrived on a day-long visit to Hyderabad on Friday also told the meeting that the elections will not be advanced. Shah told his party colleagues to prepare strategies to bring the party to power in the state.